Bay View Lodge - Barra Accommodation. The owners of Bay View Lodge have gone to great lengths to ensure that the Lodge is as comfortable as possible. Lovely ground covers and grasses have been planted to help stabilize the sand dunes thereby reducing the amount of sea sand that blows around. All roads in the Lodge as well as the road leading to the Lodge have been hard packed with coral sand making it possible for you to reach your destination by normal car. You do not need a 4 x 4 vehicle in the resort however if you wish to explore the area a 4x4 vehicle is necessary. Please note that you can fly directly from Johannesburg to Inhambane. Collection at the Airport can be arranged with the Lodge. If you expect a higher standard of comfort and still want to feel that you have received value for your money, Bay View Lodge will meet and exceed your expectations. Although the lodge is still under construction, this does not interfere with the peace and tranquillity of the lodge. For the enjoyment of your stay you can book scuba diving, whale watching, swimming with the whale sharks and other ocean adventures through us. Being on a peninsula the Lodge is between the ocean and the mangroves. The beach is 100m from the nearest cottage. For a closer look you can view the resort via Google Earth the GPS co-ordinates are: S 23 degrees 47.29min E 35 degrees 29.901min. Bay View Lodge currently has four, one bedroom units that sleep two. Three, two bedroom units that sleep four, five and six respectively. All cottages have on suit bathrooms, air-conditioning in the bedrooms, fully equipped kitchen, lounge & patio with braai/barbeque as well as a car port and boat parking area. ALL cottages are SELF CATERING. 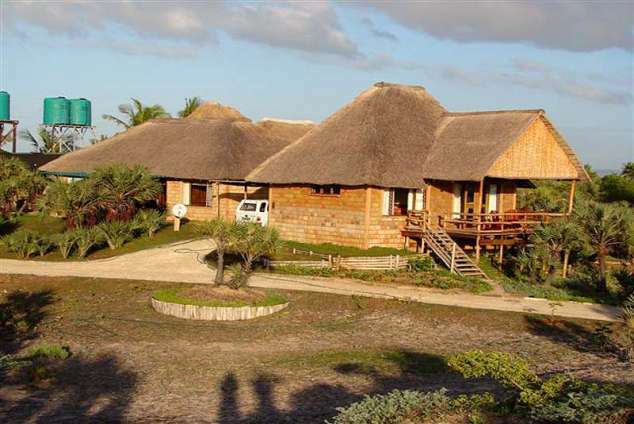 We have a lovely restaurant on site: The Green Turtle Restaurant which offers a blend of French and Mozambique cuisine. Bay View Lodge has a special DIVE HOUSE that has eight bedrooms and can sleep sixteen people. The DIVE HOUSE has four upstairs and four down stairs bedrooms. All bedrooms are air-conditioned. There are three inside bathrooms, an additional toilet up stairs and a beach shower. A fully equipped kitchen, lounge, patios upstairs and down stairs with a braai/barbeque. This house is perfect for dive groups or for a large family. Special rates apply for dive groups out of SA school holidays. 27748 page views since 15 Nov, 2007.